Do you have a room that is in need of a bit of a facelift? My girls Bathroom was that room for me. The bones were good but it looked a bit tired and there was really nothing to it. I did not have to demo anything or make it long drawn out project. I simply headed to my nearest TJ Maxx and HomeGoods with my girls and we pickup up a few items that transformed the space and gave it new life. I am so excited to share the bathroom room with you today . 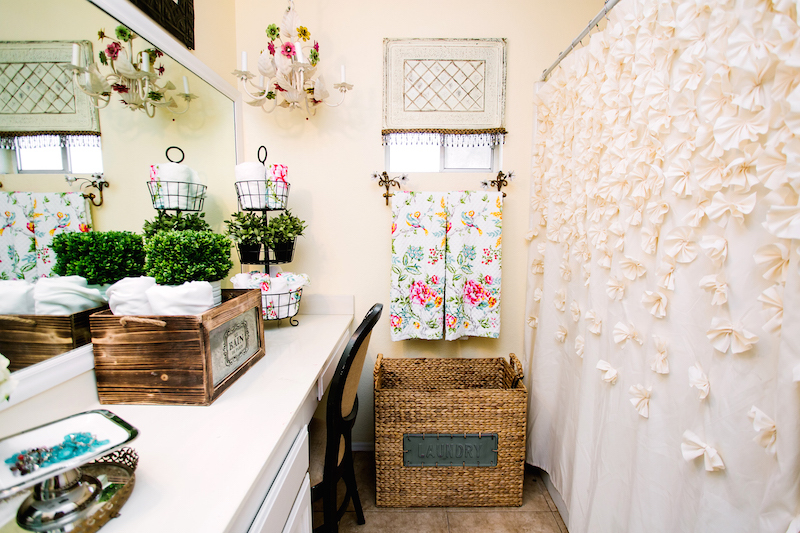 I was able to update the look of the bathroom by just changing out different accessories like towels, bath mats, shower curtain, and a few decor pieces. 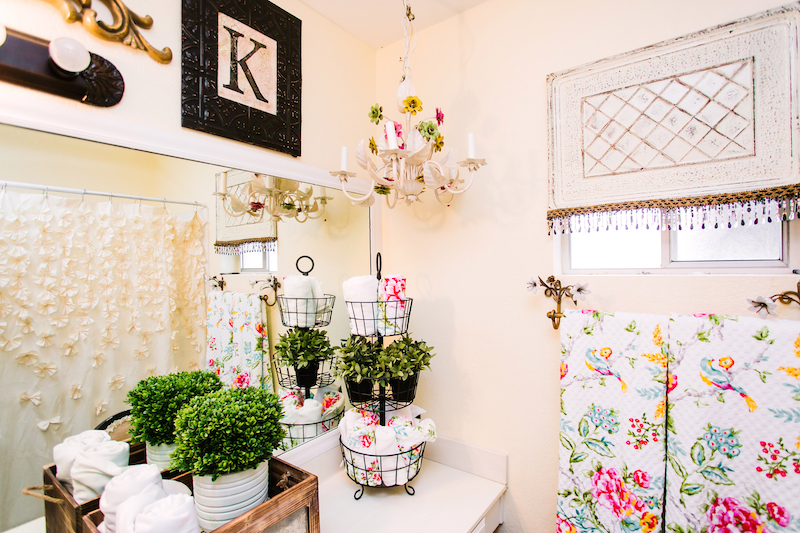 The bathroom has a fresh look that I am totally in love with. My girls are totally smitten over the new space and they loved the fact that they were able to help me go shopping! As a added bonus they now want to keep the bathroom clean because they feel so good about being able to be apart of the bathroom facelift. The feeling in my bathroom is like a breath of fresh air. The colorful and bright towels are super fun. The added such a great pop of color. I love this little plant in the Le Bain De Paris box. Both of which I found at TJ Maxx. I love the tin and wood combo. The tower that holds the cute hand towels was also a TJ Maxx purchase and it would also be perfect for hair bows or hair products. 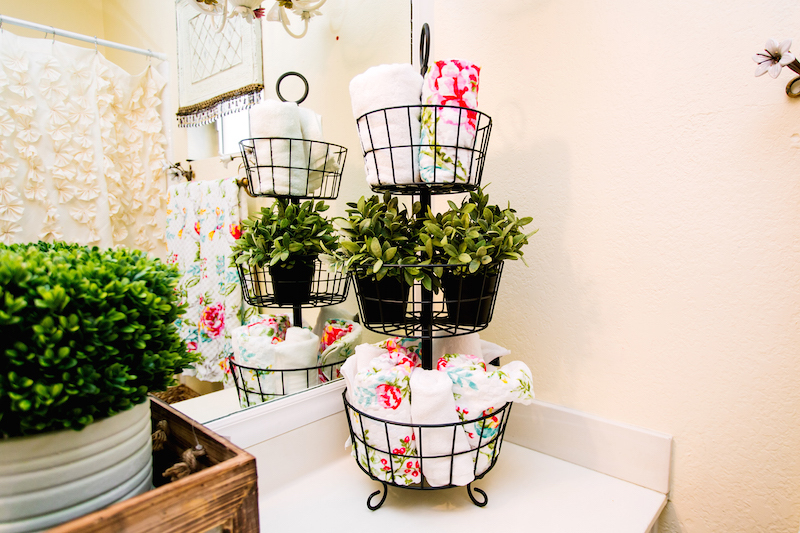 It could help keep your bathroom organized. I found this antique mirror while thrifting and I use it to hold my cute new soap dispenser and jewelry tray. 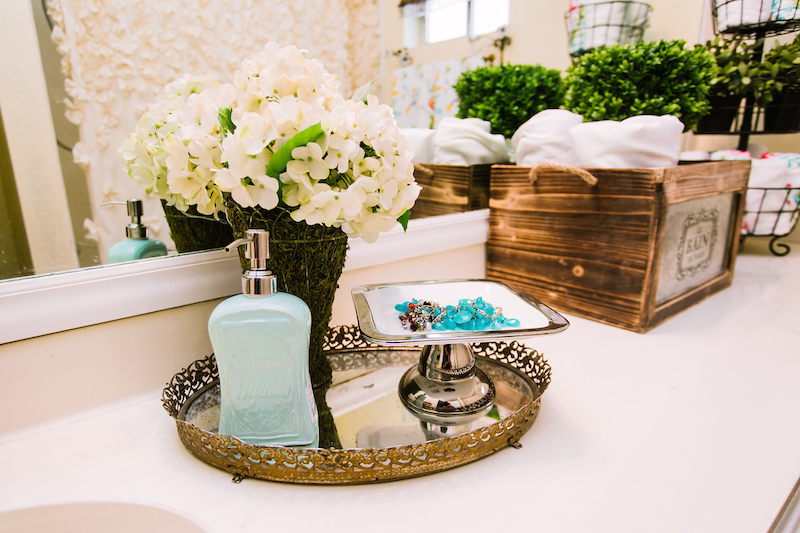 The different heights of the soap dispenser and the tray and flowers is just perfection. The long boxed plant inside in the hanging baskets is just too good. All of those items are from TJ Maxx. The Laundry basket is my everything! It my favorite new purchase for this bathroom. It’s the perfect size and it looks really dreamy. I got this chandelier a while back while thrifting but the colors were all wrong so I painted the flowers to match with the rest of the decor. The shower curtain is from Amazon. 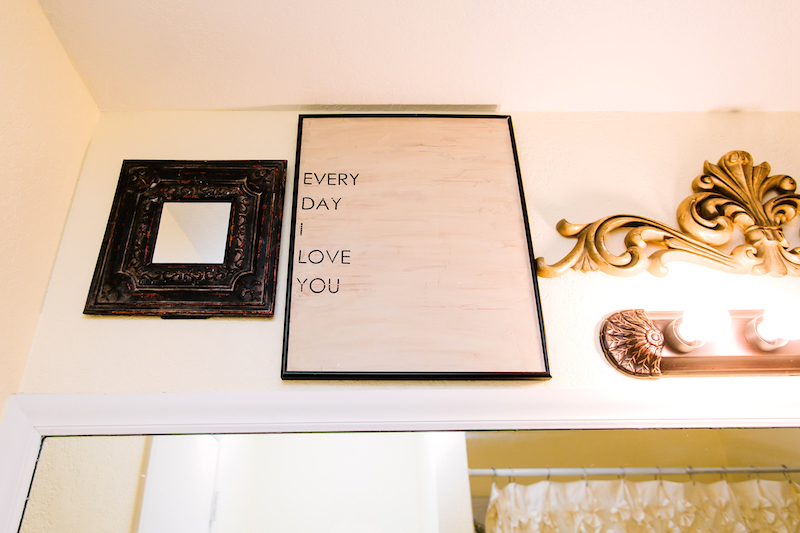 My dear friend Jill Mckee made this cute Every Day I Love you sign and it has moved around my house and is now in my bathroom added to the gallery above the mirror. Updating a room or bathroom does need mean that you need to demo something or spend a ton a money. 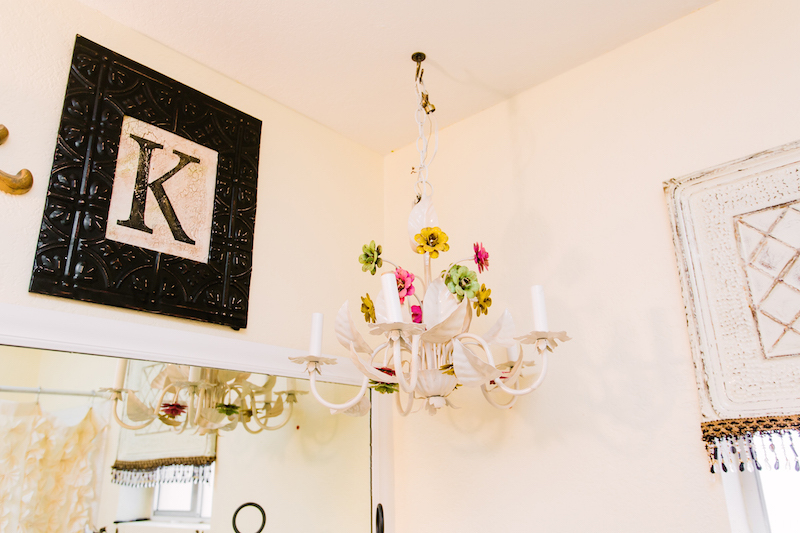 Changing out accessories can give new life to any tired old room. Now RUN to your nearest TJ Maxx and refresh your space. That is so adorable! I can understand why your girls want to keep it clean, and what a great decorating lesson you’ve taught them. Being a part of the process makes them appreciate it so much more. Now I wish I had my girls home again . . . maybe. 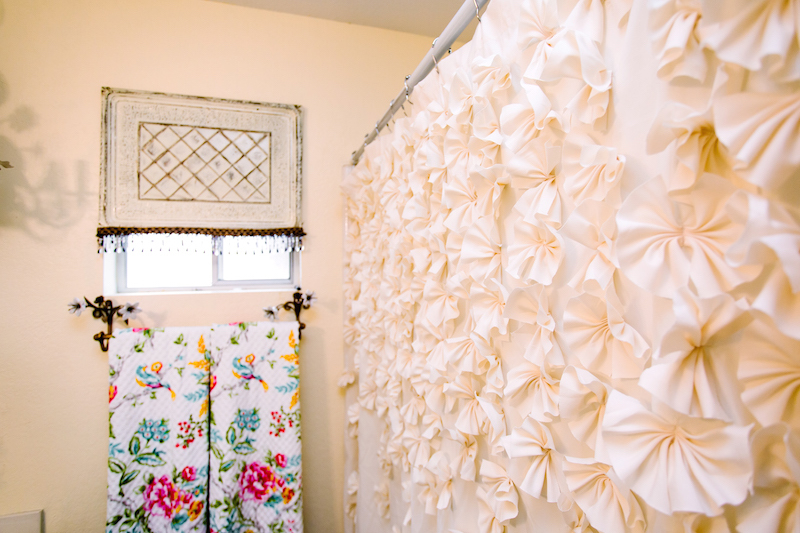 Awesome ideas to keep the bathrooms lively. Great tips. Keep them coming. That tin and wood box is adorable! 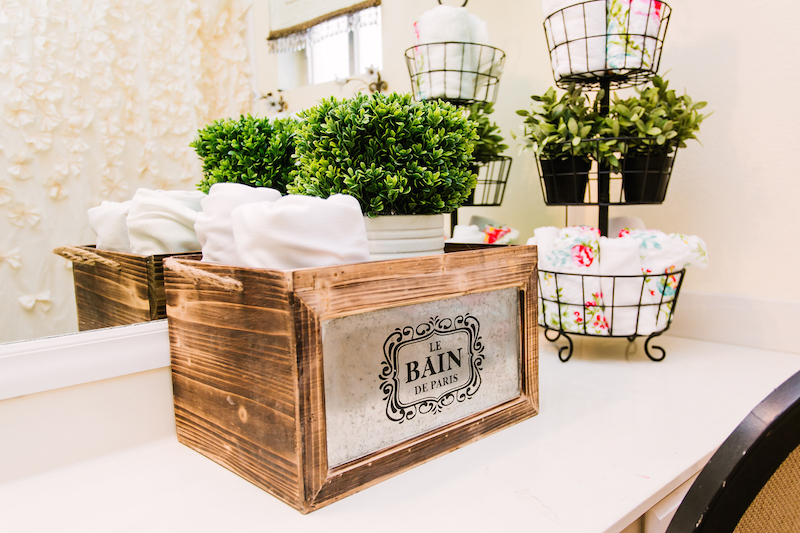 I would love to have one of these in my bathroom to hold supplies like soaps and stuff. Next time I go shopping, I am going to need to look for one of these! Lovely tips on keep your bathroom warm and welcoming. Loved them. 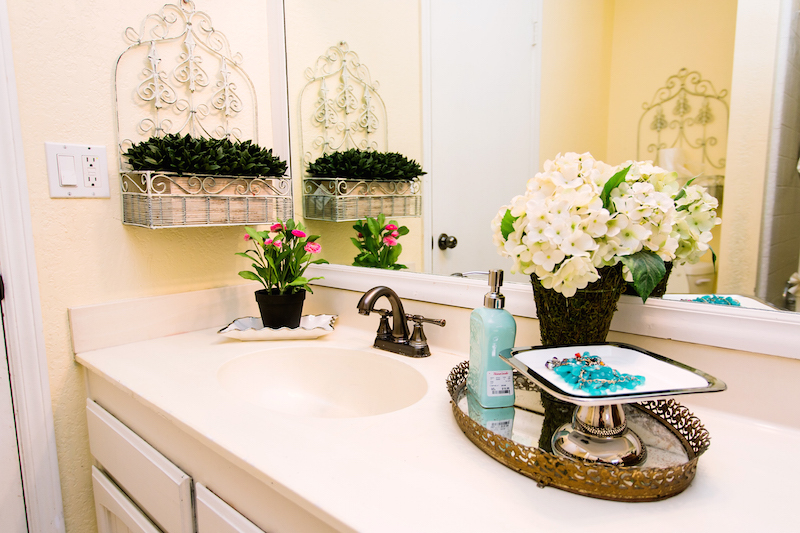 The accessories you added really give the bathroom a relaxing and peaceful feel. I would love to have a bathroom like that one. Thanks for the great ideas! 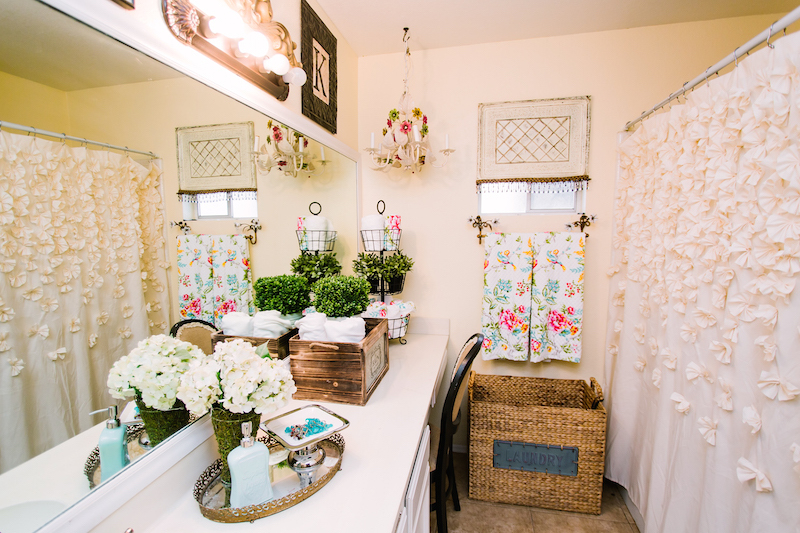 This seems like quite the cute little bathroom, it would be fun to own something so pretty. I am a bit confused on the purpose of the chair though. At first I thought it was to sit and do your makeup with, but it’s pulled in in front of a box with a plant inside. Mostly the chair is there so I can help my little ones bathe! I really like that three tiered basket with the plants. I think plants add a great touch in a bathroom. We are trying to update our master bath with some nice things and I think we need some new bath sets. The post which you have shared is really very nice with great ideas. Everyone wants their home to look adorable. 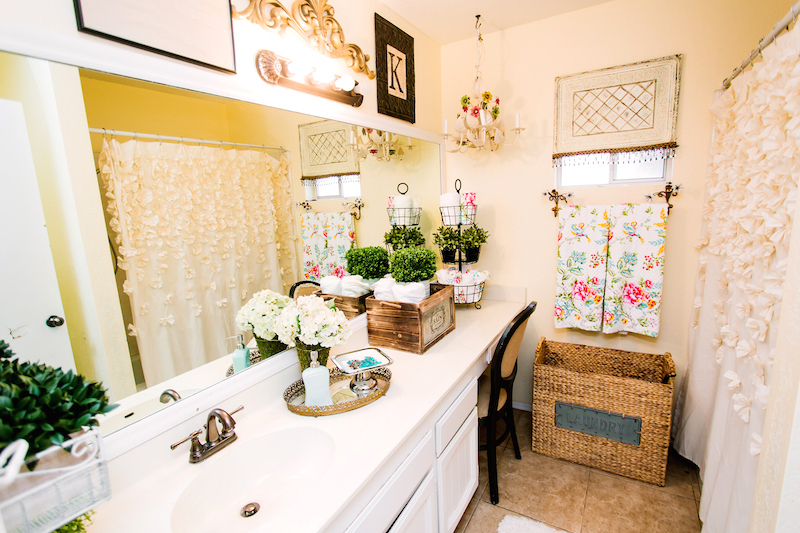 In your post you have shared how to make bathrooms of your home to look good. These are really very helpful ideas. Pictures which have shared in your post are really very nice and it give wonderful ideas. I was thinking for redesigning my bathroom and after reading your post it has given me really wonderful ideas. Thank you so much for such a wonderful post! Personally, in my own humble opinion of course, my favourite piece of your bathroom decorating and the decoration which sticks out the most of all to me, is your wall canvas saying Every Day I Love You! It just looks so clean and very minimalist, which – being a guy – I love.. Naturally! Great post! Some good ideas. I love you laundry basket. Fits perfectly with the rest of the bathroom. Can you also do a post about decorating the bedroom? Thanks!